UMKC is often referred to as Kansas City’s university because of the rich connections forged between the business and civic communities and the university. This is exemplified by the UMKC Trustees’ Scholar Program. The Trustees’ Scholars Program brings the best students to UMKC campus and connects them with community sponsors. Through internships, mentoring and ongoing networking, the scholars develop strong relationships with Kansas City’s business and civic leaders. Many local companies, such as Kansas City Southern, sponsor scholarships and take an active mentorship role with the recipient of their award. As a Kansas City headquartered business, Kansas City Southern has many ties to UMKC and the UMKC Foundation; Warren Erdman, Executive Vice President of Administration and Corporate Affairs for Kansas City Southern, serves on the Foundation and Trustees’ Board. Warren, along with Kevin McIntosh, Assistant Vice President of State and Local Relations for Kansas City Southern, worked to establish Kansas City Southern’s Trustees’ Scholarship. Kevin has taken the role of mentorship to the four students who have been sponsored by KC Southern. He also currently serves on the Henry W. Bloch School of Management Advisory Committee. For Kansas City Southern, their vision for their participation in the program has adapted over the years. 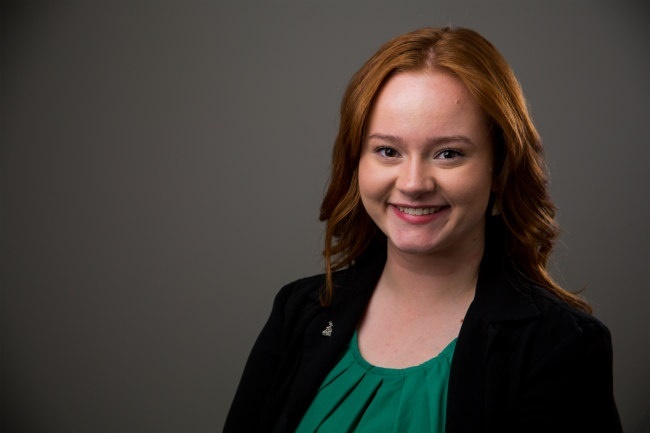 Katelyn McAlister is the current Kansas City Southern sponsored Trustee Scholar and from Raytown, Missouri. She is studying Business Administration. Scholars in the program receive a full-ride scholarship, two years of on-campus room and board, a stipend for living expenses for the additional two years, internship opportunities and support from the UMKC Board of Trustees. Kansas City Southern’s involvement in this program has been very beneficial to both the students sponsored and to the university. UMKC is proud of the Trustees’ Scholars Programs and its strong partnerships in the community, such as Kansas City Southern. If you would like more information on the UMKC Trustees’ and their Scholars Program, please visit https://www.umkc.edu/trustees/default.asp.